Dublin offers an impressive range of restaurants, cafés, and shops. Many of these opportunities are within a short walk from The RDS. Ireland is home to international brands such as John Rocha, knitwear designer Lainey Keogh, hat designer Philip Tracey, and Orla Kiely of handbag fame. The country is also a cosmopolitan hub, reflected in the wide variety on offer. The central shopping area, from O’Connell Street to Grafton Street, is pedestrian-friendly and easy to navigate; you’ll find retail and speciality shopping, at surprisingly competitive prices. The High Street brands are generally located on the North side of the city and the smaller local shops on the South side. If you are looking for gifts that are typically Irish, head for Nassau Street, which runs right alongside Trinity College. Here you will find a wide selection of woollen knitwear, tweeds, Irish crafts and traditional music in a number of shops sitting literally shoulder to shoulder on the southern side of Nassau Street. Grafton Street is Ireland’s premier shopping mile. The wide pedestrian zone invites you to window shop at your leisure, stopping at the many different fashion boutiques, shoe shops, jewellers, and the exclusive Brown Thomas department store. Brown Thomas offers the widest selection of luxury designer labels in Dublin. Stephen’s Green Shopping Centre resembles an old time Mississippi river boat with its ornate white metalwork and glass façade. Stephen’s Green features a Benetton flagship store, fashion discounter TK Maxx, a Dunnes Department Store and several boutiques by surf wear brand Quiksilver and other labels. The centre also features more than a dozen cafes and restaurants, including a TGI Fridays and a Wagamama Japanese noodle bar. Avoca combines traditional Irish wool weaving with bright, stylish designs in a small village in the Wicklow Mountains. The look fast became fashionable in Ireland and abroad, and the Avoca brand has since branched out into ladies clothing, home accessories and more – all in the trademark bohemian, slightly funky Avoca style. The Avoca flagship store in Dublin is a city centre emporium of Irish style spread over four floors. From funky kitchen utensils and delicatessen in the basement, ladies clothing and home wares on the ground floor, gifts and knickknacks on the mezzanine to wooden kids’ toys, Avoca is a great store to rummage around in. 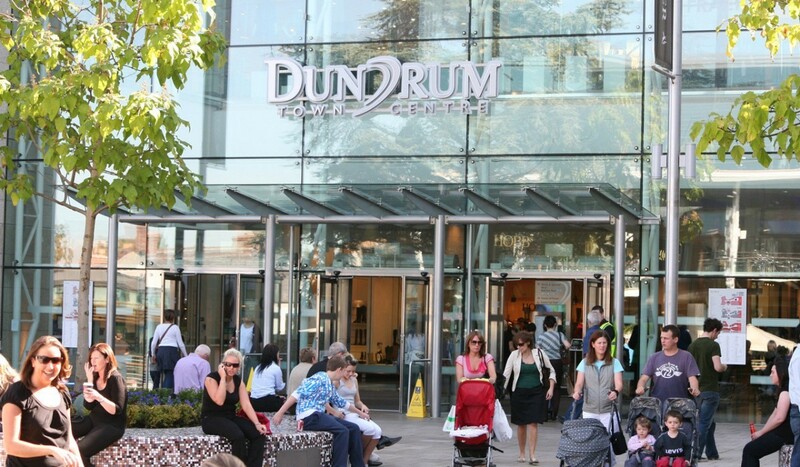 Designer Shopping: Dundrum Town Centre is Dublin’s most upmarket shopping mall with outlets by exclusive London department store Harvey Nichols and a dependence of Brown Thomas’ BT2. The centre is home to many UK High Street brands including House of Fraser, Next, Monsoon, LK Bennett, Molton Brown, and more. You also get branches of US brands Urban Outfitters, Timberland, and Tommy Hilfiger. The generously proportioned and landscaped centre further features cafes, restaurants and a cinema. The Dundrum Town Centre is located on Dublin’s South side and can be conveniently reached from St. Stephen’s Green with the Green Luas tram line (Dundrum stop). Kilkenny Design Centre is a one-stop shop for established and up-and-coming names in Irish design. In the bright and airy building opposite Trinity College you will find pottery, crystal glass, silverware, wood craft, handmade jewellery, ladies clothes, handbags, and accessories by Orla Kiely, Stephen Pierce, Nicholas Mosse, John Rocha, and more. The top floor is home to a restaurant and coffee shop overlooking Trinity College. The food and the relaxed atmosphere make this a very popular lunch destination for Dubliners. This covered former Victorian market hall with ornate red brick facade and glass roof is home to a funky selection of small stalls and shops. From used books to records, CDs, vintage clothes, and streetwear, Georges Street Market is a must for trend conscious shoppers. Location: Between Drury Street and South Great Georges Street. High Street Fashion: Henry Street and its extension on Mary Street is a popular shopping destination on Dublin’s North side, running East-to-West between O’Connell Street and Capel Street. On Henry Street and Mary Street you will find many UK High Street retail brands such as Body Shop, Game Stop, HMV, Office, Early Learning Centre, and more. Henry Street is also home to Arnott’s Department Store, a Dublin institution. Moore Street, which branches off Henry Street just before the Ilac Centre, is home to a daily fruit and vegetable market. You will also find many ethnic shops here, trading in Asian, African and Middle Eastern groceries and spices. Jervis Centre is located directly opposite the Ilac Shopping Centre and offers a wide range of shops from ladies’ and men’s fashion to books, kids’ toys and arts and crafts. Retailers at the Jervis Centre include Wallis, Waterstones and Schuh, among others. Ilac Centre is home to large flagship stores by fashion retailers H&M and Debenhams. It also features a dozen smaller boutiques plus cafes and Dublin’s central public library. Hours: Monday – Sunday 12–3 pm & 5:45–10pm. Running since 1992, Roly’s is still a bustling Brasserie doing delicious reasonably priced smart food. Their famous Prawn Bisque and Kerry Lamb Pie and Fish Pie have been on the menu since the first day the opened. They have House Wine as well as a dozen wines in their House Selection. They also have an extensive wine list and a wide selection of wines by the glass. Address: 9 Ballsbridge Terrace, Ballsbridge, Dublin 4, Ireland. Hours: Monday – Saturday 18.00-21.45pm. The Lobster Pot offers extensive selection of seafood sourced daily, Irish meats, free range poultry and game when in season. They also have assembled an impressive wine list and offer a full licensed bar. Address: 2 Merrion Road, Ballsbridge, Dublin 4, Ireland. Hours: Monday – Saturday 17.30-23.00pm. Al Boschetto is an Italian family-run restaurant. Established in 1996, it is run by a husband and wife team, Loreta and Jimmy. At Al Boschetto, we cook our food the authentic Italian way. We only use fresh, carefully sourced and seasonal ingredients, sourced from both Italy and Ireland, to make all our beautiful, rustic dishes. Our stone baked oven was imported from Italy for that authentic Italian taste. Address: Sweepstakes Centre, 22-30 Merrion Road, Dublin 4. Belluccis is a New York style Italian restaurant offering great Italian food, an extensive all Italian wine list and the most wonderful cocktails and mixed drinks. Located in Dublin’s exclusive D4 area close to some of the citys top hotels; The Herbert Park, The Sandymount, The Ballsbridge and it is close to the Conference venue as it is opposite the RDS. Address: 16 Merrion Road, Ballsbridge, Dublin 4, Ireland. Ban Thai strives to serve only the best, most Authentic Thai Cuisine to be found in Ireland. The restaurant is Thai family owned and all of whom are extremely passionate about Thai food and as it is part of their daily lives and culture. The Bridge 1859 is the only bar in Ireland with Pilsner Urquell’s revolutionary tank beer system. It allows to us to serve fresh unpasteurised beer to the customer. Wood fired pizzas for delivery & takeout. Chain branch selling fair-trade coffee and chocolate, plus tea, sandwiches and salads. Lolly and Cook are dedicated in producing deliciously fresh savouries and cakes directly from our bakery in various location in Dublin City. Their Herbert Park café has a much more relaxed vibe in an original and beautifully situated location.